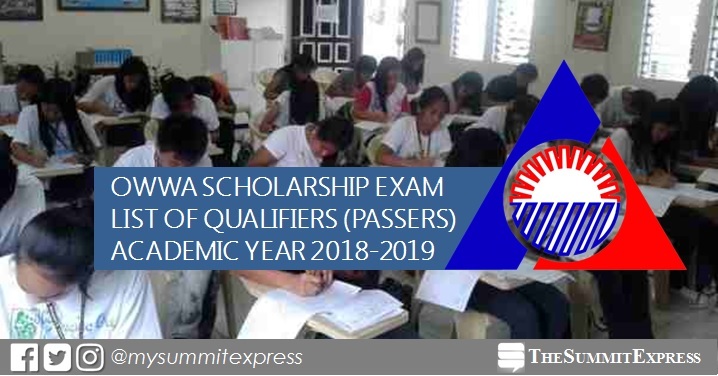 MANILA, Philippines - (Updated April 28) The Overseas Workers Welfare Administration (OWWA)'s Education for Development Scholarship Program (EDSP) and Congressional Migrant Workers Scholarship Program (CMWSP) exam results for academic year AY 2018-2019 are officially released online on Friday, April 20, 2018. View on this page for the list of qualifiers (passers) and topnotchers. Of the 3,249 children of OWWA members who vied for the DOST-SEI Undergraduate Scholarship Examination conducted on October 15, 2017 in 17 regions and in Alkhobar and Riyadh, Kingdom of Saudi Arabia, only 13.85% made it to the top 400 slots enlisted for the EDSP and 50 slots for the CMWSP. The EDSP is a scholarship grant offered to qualified beneficiaries or dependents of active OWWA members who intend to enroll in a 4-5 year baccalaureate course in any preferred colleges or universities. It shall be in the form of financial assistance amounting to a maximum of P 60,000.00 per school year. EDSP is being offered to incoming freshmen and those already enrolled in college who have met the age and academic requirements. Meanwhile, the Congressional Migrant Workers Scholarship Program (CMWSP) is extended to deserving migrant workers and or their immediate descendants who intend to pursue 4 or 5 year courses in the priority fields in Science and Technology. Educational assistance is P 60,000.00/year funds from the PCSO. In the 2014 and 2015 OWWA scholarship exam, results were released after six (6) months. The top 200 EDPS passers out of 4,476 applicants in 2014 and 4,734 hopefuls in 2015 were selected. Monitor this page for the announcement of results. You may also visit the official website of OWWA for more information.